Fire in Dubai 'Torch' skyscraper Jump to media player A fire has ripped through the 79-storey Torch Tower in Dubai, but no casualties have been reported. Fire sweeps Turkey skyscraper Jump to media player Hundreds of people are evacuated from a skyscraper in Istanbul after a large fire broke out in the 42 storey tower block. Chechen skyscraper engulfed in flames Jump to media player Officials suspect an electrical fault is to blame for a fire which engulfed an unoccupied skyscraper in the Chechen capital Grozny on Wednesday. 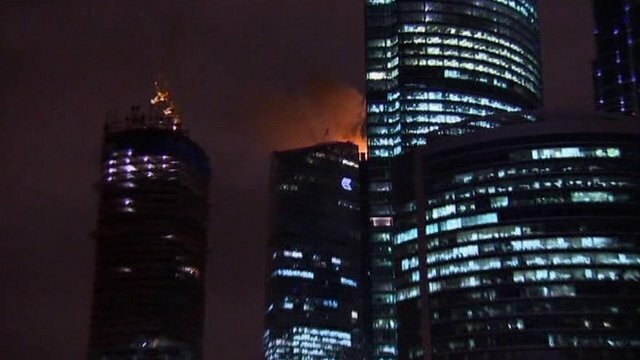 Fire crews tackle Moscow tower blaze Jump to media player Russian fire crews have tackled a spectacular fire that engulfed the top of a Moscow skyscraper still under construction. 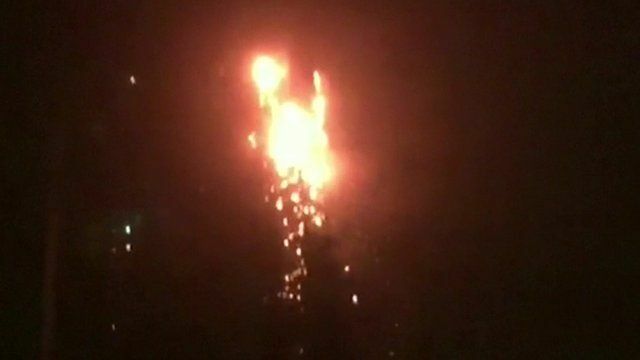 A fire has ripped through the 79-storey Torch Tower in Dubai, but no casualties have been reported. The tower stands at 336m, making it one of the world's tallest residential buildings. Hundreds of people had to be evacuated.